In addition to standard websites, we also develop bespoke online and offline applications for various customers' needs. Century Cinemas advertise the times that they show movies in the local press. The weekly process of manually preparing the listings to send to the newspaper advertising teams is very time consuming, and prone to errors which can be costly. 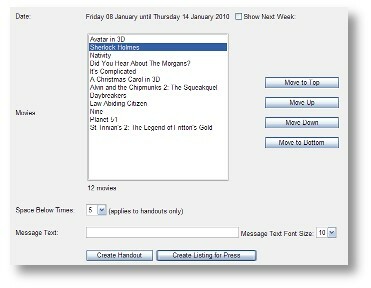 Presto Web Design built an online application enabling the cinema staff to compile the list of movies and times from their existing booking system. The application allows the staff to sort the order of the movie listings, add footnotes, and save the listings in PDF format. The cinema staff can compile the list of movies and times from their existing booking system in 2-3 minutes. Various formats are available, a version for inclusion in the weekly email newsletter, a version for sending to the press in the exact format that they require, and a version allowing the cinema staff to print leaflets for handing out to patrons. Duffy Express Freight are the leading freight and haulage company in the Northwest of Ireland, delivering goods throughout Ireland and beyond on a daily basis. 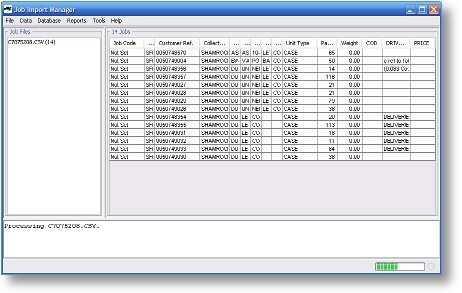 Load manifest files containing information regarding each package to be delivered are emailed nightly to Duffy's by their freight partners, and this information is used to create delivery jobs on their booking system. The files are in various formats (CSV, PDF, etc. ), and although some files can be imported directly into the booking system or manually altered to allow them to be imported, the contents of most manifest files were individually typed into a form on the booking system - a process which usually took 10-12 man-hours. The company needed a simple and quick way to get load manifests into their current booking system. Presto Web Design developed a Java application to parse the various manifest files and create new records in the booking system's database. Additionally, each job is automatically priced, saving further work at a later stage. The application processes all the files in 5-10 minutes, allowing the night staff to process loads much more quickly.